Over the coming week, you'll find position-by-position projections for the 2019 Jackson Generals, with new players examined each day. There are no guarantees made: Jackson's 25-man roster for Opening Day will be impacted by injuries, Spring Training performance, transactions, and many other unpredictable elements. None of the players included in this preview have previously spent significant time at a level above Double-A. You can stay up to date with relevant Generals and D-backs news by following us (@JacksonGenerals) and the D-backs (@Dbacks) on Twitter. DELUZIO: Elite speed (34 SB in 68 games). Intercontinental range in CF, capable arm. Instincts still growing. Punched out a lot in April, but came back in July refreshed (.355 BA, 14 BB, 15 SB). Needs more seasoning in all facets, but raw tools are promising. With improved durability (two DL stints in 2018), can be the best table-setter in the league. Likely Opening Day starter in CF. GONZALEZ: MILB Rule 5 Draft selection in December 2017 proved his mettle with the wood (.287 BA) despite extended time on the DL. Contact hitter with great bat control. Nagging injuries limited his speed in 2018, but should have his wheels back in 2019. Can play both corner outfield spots, though arm is more suited for left. MOROZOWSKI: Called up when Gonzalez was hurt. Struggled at the plate. Demoted midseason to High-A, where he hit .309 in July before returning to Jackson. Drove the ball better late in the year and hit lefties (.286 BA vs. LHP). Arm of a former pitcher. Good range, can get better. WILSON: After a breakout 2017 at Low-A Kane County, struggled with contact at High-A (141 Ks). Doses of speed (16 SB) and power (10 HR) as advertised. Played all his 109 games in CF. Could take over mid-year if DeLuzio plays into a chance at AAA. KARAVIOTIS: Former University of Oregon SS transitioning to 1B/corner OF role. Finished 2019 on the DL at High-A after batting .285. Lacks consistent over-the-fence power, but can get extra bases. Like Jamie Westbrook before him, the bat comes first. Must get ABs where he can. Good arm. BAEZ: December waivers claim from San Francisco. 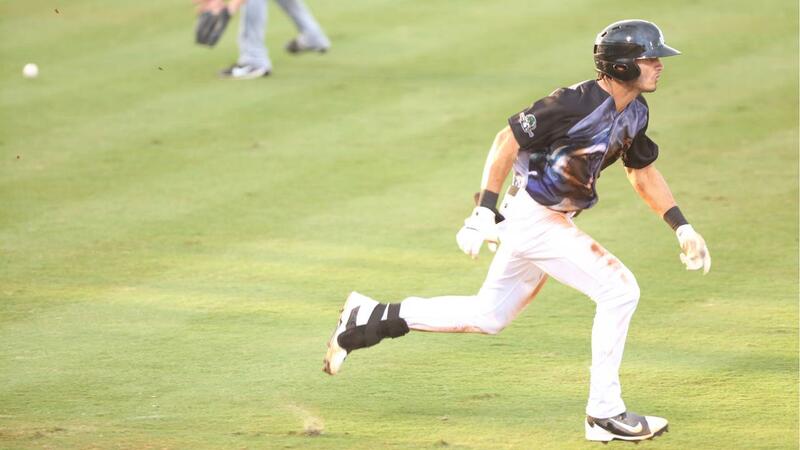 Southern League veteran who earned Midseason All-Star honors last year with Tennessee. Has some speed-16 steals last year, with 203 in his career-but not enough for center field. Racked only 6 outfield assists last year after throwing out 12+ men in each of the three previous seasons. Like 2018 General Galli Cribbs, tore the cover off the ball last April (.397 BA), but tapered off later in the year (.208 in Second Half). Needs to show a reliable stroke. WESTBROOK: Both a Midseason and Postseason All-Star in 2018, had his best offensive campaign in three years (.292/.341/.497, 19 HR, 74 RBI). Played a handful of games at Triple-A and showed well (9 hits in 23 at-bats). Got hurt in August at Chattanooga and missed the playoffs. Will turn 24 in June, but in his fourth Double-A season, he's proven he can handle a bat in this league. So what's left? Showing he can make his glove more capable in the outfield. Made 5 assists and 4 errors last year, but range and reads can improve. Hopefully will get the chance to return to Reno with strong play in the First Half. The Jackson Generals, a West Tennessee franchise since 1998, are the Double-A minor league affiliate of Major League Baseball's Arizona Diamondbacks. In 2017 and 2018, The Ballpark at Jackson was named the Professional Sports Field of the Year by the Tennessee Turfgrass Association. The 2018 Southern League champions will defend their title beginning in April - get tickets today at 731.988.5299!